Since 1987, our Heart of House Services team has provided a full scope of professional managed services to top-tier hotels and resorts throughout the country. Our unique turn-key model helps property managers devote more time and energy to driving revenue. As a quality leader, we offer consistent leadership and oversight of the hotel or resort’s most challenging departments, taking complete accountability of recruitment, training and operations. We complement this with our proven Quality Management Program and Quality Assurance Program, where we inspect our work each day and track results on a weekly basis. Our services are broad and deep and are tailored based on the needs of the property. You only get one chance to make a first impression on your hotel or resort guests – let us help you make it a positive one. We offer over 30 years of proven success. Keeping public areas clean and inviting is integral to your success and your guests’ first impression of your hotel or resort. Our Heart of House Services team discreetly maintains the high level of cleanliness, day and night, you demand and your guests expect. By utilizing a round-the-clock staffing model, proprietary technology and set operating standards, we provide levels of service and attention to detail that achieve the best results. Our public area services include 24-hour cleaning of the lobby, restrooms, conference spaces, restaurants, fitness center, pool area, spa, bars, nightclubs, and property-specific areas. We have been providing overnight cleaning services to hotels and resorts since 1987. In those 30 years, we have perfected the processes and procedures. The importance of overnight cleaning is not lost on us. With our set operating standards, we ensure that your public areas and back of house spaces are gleaming each day. Our daily overnight cleaning services include cleaning of the lobby, restrooms, conference spaces, restaurants, kitchens, fitness center, pool area, spa, bars, nightclubs, and property-specific areas. Whether your floors are tile, wood, carpet, vinyl or concrete, we’ll make sure that they look their very best. The Service Companies is the leader in floor care for the hospitality industry. Our results prove it. We’ve spent years honing our technique and spend hours training our staff in the best ways to care for any type of flooring. We specialize in marble care and restoration. Our team of experts will repair any damaged marble via our three-step restoration process: diamond grinding, sealant application and buffing — guaranteeing a shine that mirrors the marble’s original luster. For each property, we start off with a full assessment of the floor types to determine a floor schedule and equipment needs, while working with Ecolab to spec out the right chemicals and cleaning processes for all surfaces. 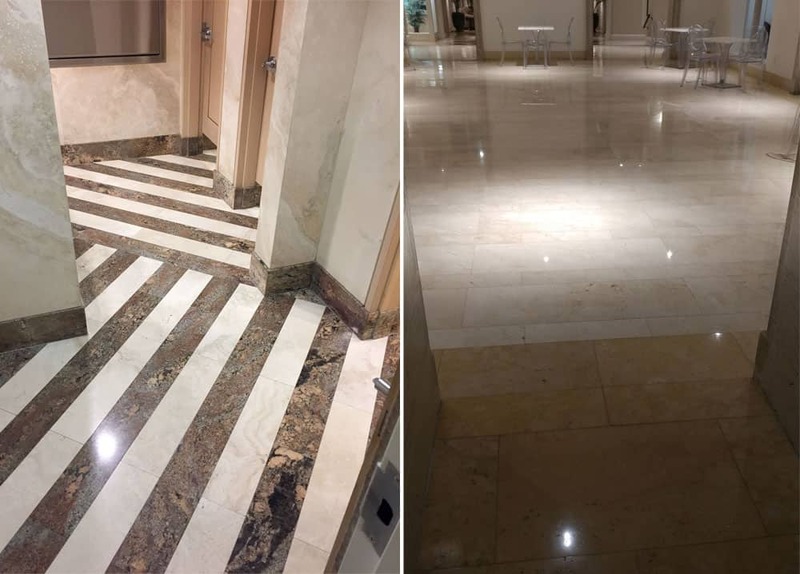 To maintain the sheen, we polish the marble every day using either natural polish, crystallization or vitrification materials according to your preference and exacting standards. Our stewarding team provides support to your hectic kitchens no matter how large or small. When running a busy, bustling kitchen, it is essential to have a reliable stewarding team working side-by-side to support your kitchen personnel and keep it clean and orderly. Our expert stewarding services department, with our proprietary model, will make sure that your staff has the equipment that they need, when they need it, without getting in the way and keeping your costs in check. Our experience spans kitchens of all sizes, including those within large hotel and casino complexes. In need of supplemental stewarding staff? Learn more on our Staffing Services page. We are experienced in keeping kitchens, equipment, tile and grout pristine for the health and safety of your guests and employees. The Service Companies’ kitchen deep cleaning team recognizes the vital importance of meeting and exceeding Health Department codes and maintaining those standards at all times. The health and well being of your employees and clients, as well as the success of your business, hinge upon this. Our team is adept at executing proper cleaning procedures on kitchen equipment and floors. We are at the forefront of cleaning techniques and procedures, while using the most effective and safest products. We are the largest provider of turn-key housekeeping services to the hospitality industry in the nation, cleaning over 5 million guest rooms a year in properties of all sizes. In our turn-key housekeeping operation, we are responsible for every aspect of managing and running your largest, and most complex department: cleaning hotel rooms and hallways, providing turndown service, managing equipment, and completing scheduled “deep clean” room maintenance. Each housekeeping department is led by a seasoned Housekeeping Executive and is backed by a team of highly skilled attendants and quality assurance inspectors. This full-time property manager is no more than two levels removed from our executive team and ensures that our housekeeping department works as an extension of your team. Our laundry management services help your housekeeping department run more efficiently. Ask any Housekeeping Director and they’ll tell you that effective laundry management is a key factor to ensuring housekeeping runs well. The Service Companies will manage your laundry and linen contracting service or on-site facility, making sure to maintain the appropriate inventory levels from day-to-day, week-to-week. Our best-in-class training spanning all positions sets our teams up for success and guarantees superior service. We partner with the most trusted providers in the industry to consistently set the quality standard in the marketplace. Our clients include some of the most prestigious hospitality brands. Explore a career with limitless possibilities.